Pete Oakley, the Director of Golf for The Rookery Golf Course near Milton, is about to embark on a new European adventure. The 2004 British Senior Open champion is taking advantage of the continuing exemptions that victory earned him, after a challenging 2005 season on the PGA Champions Tour. Oakley failed to earn enough money to keep his exempt status on the Champions Tour past the year’s competitive opportunity he earned from that big win. Nonetheless, he managed to pocket $192,293 in official money, and achieved a special notoriety by hitting the first hole-in-one in Champions Tour competition during 2005. He didn’t do so well at the Senior Qualifying School tournament late last fall, however, withdrawing before the final round. On the other hand, the 2004 major win gave Oakley more chances to extend his playing career beyond last year’s experience. In fact, Oakley began 2006 with a January trip to Hawaii for the Champions Tour’s Mercedes Championship at Hualalai. He finished tied with Gary Player for 34th place in the limited field event, picking up a nice little $13,250 check for the week. Oakley then took a break from the big time, and busied himself with a move to Palm City, Florida, in part for the tax advantages. His son Zac joined him, and the two are playing some events together as Zac begins to try his luck on the National Golf Association’s Hooters Tour. The father and son duo finished in sixth place in a recent Treasure Coast senior pro/ junior pro event. “Zac has some real promise. We put a little syndicate together of investors from Kent and Sussex County. Zac will have a year to see if he can make his expenses and maybe more,” Oakley said. Oakley’s first European Senior Tour event takes place March 1-3, at the DGM Barbados Open at the Royal Westmoreland Golf Club. He tied for tenth place in 2005, and he’s looking forward to returning to the Caribbean. He plans to return to the Champions Tour for the Legends of Golf tournament in Texas in April. Oakley will be paired up with former PGA Tour player Bob Lund for that event. Venice is Oakley’s second stop on the European Tour, in early May. “I’m going to Italy, and then I’m playing in Europe for ten straight weeks,” Oakley said. “I’m still exempt for most of the major Senior events, and I plan to play in them, also. I know I can play in the U.S. Senior Open, the Jeld-Wenn Tradition, the British Senior Open, and the PGA Senior Open. I’m not sure about whether I’ll be able to play in the Ford Championship,” Oakley explained. Oakley is continuing his relationship with The Rookery and Delaware golf. He’ll just be busy chasing his golf dream across the pond for most of the season. Golfers who are new to the Cape Region might not realize that there are several private club membership opportunities in the area, in addition to several fine public golf courses. This note begins a short series describing the various country clubs that are open to membership applications. 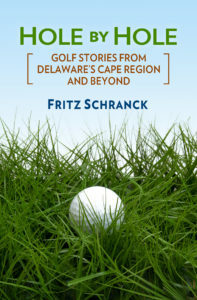 Quite a few Cape Region golfers belong to Shawnee Country Club, a short drive up Route One to Milford. The challenging par-70 course (71 for women) includes three par-5s and five par-3s. It’s one of the most walkable courses in the Delmarva Peninsula, and a great bargain. There are no initiation fees. Memberships are available in several different classifications, with annual dues including golf privileges ranging from about $1,600 to about $2,000. New members also purchase a share of stock for $1,000, payable in installments over the first year. For more information, call the club at 302-422-9745.